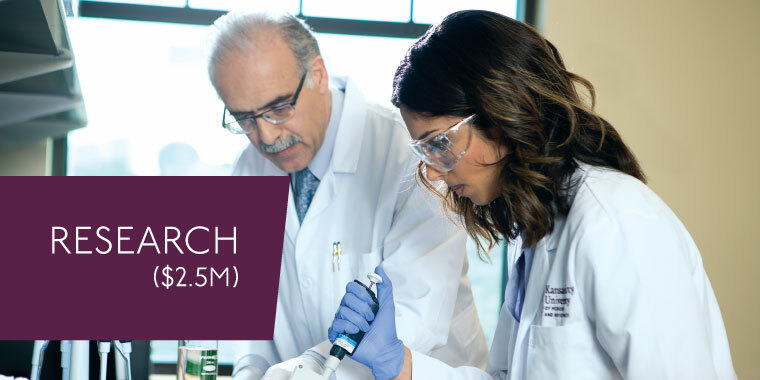 Our strategic emphasis on enhancing translational research both benefits our students’ education, and contributes to medical-and-scientific-related discoveries that will make a difference for patients. Translational research requires a collaborative approach. As such, we have established unprecedented partnerships with area biomedical partners and health sciences universities to advance our work, including our membership in the Kansas City Musculoskeletal Disease Research Consortium. However, we need to increase our investment in internationally recognized faculty and state-of-the-art equipment to accelerate scientific discoveries, which will directly impact the lives of all those living with such diseases. Increase core equipment investment to advance biomarker detection. This will strengthen the understanding of disease processes and will help develop important new therapies for patients in need. Establish an endowed Research Chair in Neuromuscular Disease to enhance national and international research capacity, with the ultimate goal of finding cures for neuromuscular disorders.